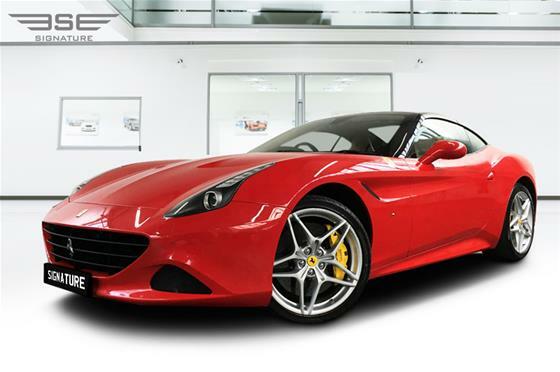 Signature’s fleet of Ferrari self-drive vehicles are simply stunning. Sleek, glossy, performance driven and hugely desirable, each model is designed to appeal to supercar enthusiasts. Whether you are looking for a weekend rental for a romantic break or want to rent a Ferrari for a special occasion we have a model which will get your pulses racing. All our Ferraris are built to the highest specifications ensuring your driving experience is thrilling from start to finish. Edgy, performance driven and exciting, these cars are packed full of gadgets, gismos and the latest technology. To see which Ferrari suits your car hire needs, simply click on the model above for prices and further information. Alternatively call one of our experienced customer care advisors on 0207 118 2244 who can talk you through all the benefits of each model we have on fleet in our London showroom. Born in 1947, Ferrari has always produced vehicles at its current site and has maintained its directions. It has progressively widened its range using visionary planning both on a design level and on the quality of work produced. A town in northern Italy, near Bologna, Maranello has been home to Ferrari since the 1940s. At more than 250,000 sq metres, the factory's 45 buildings house more than 3,000 workers. It is here that passion; innovation and technology combine to create the company's GT and Formula 1 cars. On 3 December 1942, planning permission was granted for a small plant making machine tools in Maranello. From the Scuderia Ferrari headquarters in Via Trento Trieste in Modena, Enzo Ferrari chose to go to Maranello because, as he wrote in his memoirs, he owned "a piece of land in the immediate vicinity of where the factory is today". To learn about Ferrari Car Hire, you need to go to the beginning with Enzo Ferrari, the founder of Scuderia Ferrari as the company is officially known. Enzo Ferrari was committed to seeing his vision of performance cars that can beat the competition. Piero Ferrari is the only living son of Enzo Ferrari and he plays an important role in the company, which is helping the marque achieve rave reviews and great Ferrari testimonials. Ferrari is preserving its heritage with Galleria Ferrari (Ferrari company museum dedicated to the Ferrari sports car Marque). Galleria Ferrari is only 300 metres away from the marque's factory in Maranello, the home of Ferrari's factory. 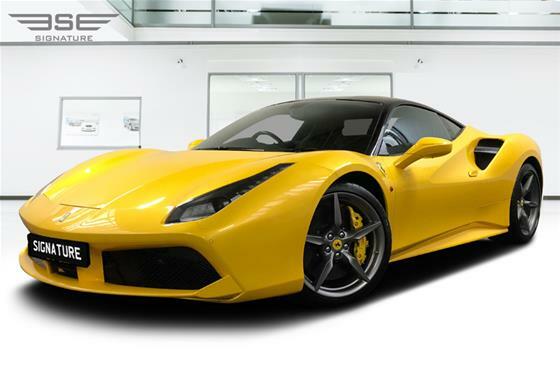 Ferrari Reviews focus on the performance and style of its cars like the 458 Spider and the California, two cars that buyers have embraced thanks to their highly-performance focused elements such as their engines and transmissions. 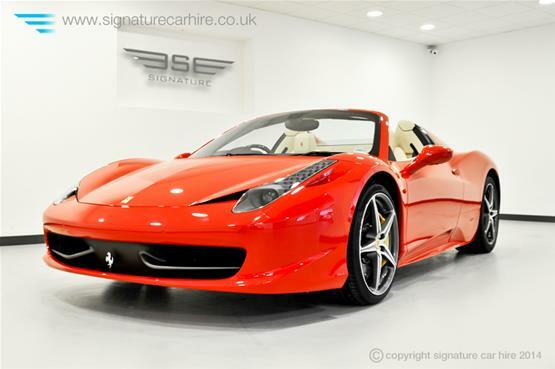 The Ferrari 458 Spider features a textured leather upholstery finish that inspires you to drive this car for as long as you can during your Ferrari 458 Hire from Signature Car Hire. The Split Injection technology and classic red exterior of our Ferrari Spider signifies the type of unbridled fun you would have during your Signature Ferrari Rental. The Ferrari California tells the story of a convertible drenched in Rossa Red, perfect for those special occasions that you want to underline with an entrance. Hire a Ferrari in UK to understand why the magic of Ferrari captures everyone who chooses a Ferrari to drive. Ferrari is about success and you can see this permeating through every car it manufactures. We offer a nationwide Ferrari car hire service in the UK including in and around London, the Home Counties and towns like Oxford. Enzo Ferrari's vision to create a Marque of ultra-performance cars came true thanks to years of hard work, design focus and intense attention to detail. Whether you choose a Ferrari California or Ferrari 458, there are abundant sources of car hire experiences that you will never forget if you choose a power packed Ferrari supercar. Enzo Ferrari never intended to produce road cars when he formed Scuderia Ferrari, which when translated literally means Ferrari Stable, and usually used to mean Team Ferrari, it is correctly pronounced in 1929 as a sponsor for amateur drivers headquartered in Modena. Ferrari prepared, and successfully raced, various drivers in Alfa Romeo cars until 1938, when he was hired by Alfa Romeo to head their motor racing department. In 1941, Alfa Romeo was confiscated by the Fascist government of Benito Mussolini as part of the Axis Powers' war effort. Enzo Ferrari's division was small enough to be unaffected by this. Because he was prohibited by contract from racing for four years, the Scuderia briefly became Auto Avio Costruzioni Ferrari, which ostensibly produced machine tools and aircraft accessories. Also known as SEFAC (Scuderia Enzo Ferrari Auto Corse), Ferrari did in fact produce one race car, the Tipo 815, in the non-competition period. It was the first actual Ferrari car (it debuted at the 1940 Mille Miglia), but due to World War II it saw little competition. In 1943 the Ferrari factory moved to Maranello, where it has remained ever since. The first Ferrari road car was the 1947 125 S, powered by a 1.5 L V12 engine; Enzo Ferrari reluctantly built and sold his automobiles to fund Scuderia Ferrari. While his beautiful and fast cars quickly gained a reputation for excellence, Enzo maintained a famous distaste for his customers! On May 17, 2009 in Maranello, Italy, a 1957 250 Testa Rossa (TR) was auctioned, by RM Auctions and Sotheby's, for $12.1 Million - a world record for the most expensive car ever sold at an auction. Ferrari’s spirit lies in its strength as a family business. Based in Maranello, Italy, the company was founded by Enzo Ferrari in 1929 but was established in a more concrete fashion in 1947. Known as Scuderia Ferrari then, the Marque has a rich racing heritage which was pushed by Enzo Ferrari. The company has said Enzo Ferrari’s passion for racing came after he rode an Alfa Romeo in the early 1920s. From 1929 to being part of Fiat today, Ferrari continues to maintain its unique DNA as the supercar marque of choice. Ferrari is a symbol of passion, style, and technology and one of the oldest surviving, the most well known, and the most loved team in Grand Prix Motor Racing. As with Ferrari’s road vehicles, their formula one cars proudly display their logo, the Prancing Horse, or "Cavallino Rampante" which is one of the most well known symbols in Global Motorsport. The Ferrari team is still based at Maranello in Italy. The team's new car for the 2010 season, the Ferrari F10, was launched on 28 January 2010. The present Ferrari team competes in Formula One and is managed by team principal Stefano Domenicali. Aldo Costa is the technical director and Luca Colajanni the PR manager. The race drivers are Fernando Alonso and Felipe Massa, with Giancarlo Fisichella the third/reserve driver. Alonso is contracted for three seasons (2010–2012), with speculated options until the end of 2014. The 90s was the decade of incredible Ferrari success. With superstar drivers like Michael Schumacher, the Marque had its footprint in Formula 1 seen. Known as the great comeback to the company, Ferrari also is known for other incredible drivers such as Fernando Alonso and Felipe Massa. Ferrari is the marque for winners and Formula 1 has proven this over and over again. A Classic Super Car Successor to the Ferrari F430, this high octane performance car has evolved from an entirely new design. With its classic red rosso corsa exterior and luxurious cream leather interior, no doubt it will make heads turn this Summer. Already in demand from those of you who have spotted it on our website, we know this car will be a favourite throughout the Summer months and beyond! Cutting Edge Design Designed to fulfil the expectations and ambitions of their most passionate clients, the 458 Italia continues Ferrari’s tradition of putting the thrill into driving by incorporating technologies developed from the their experience in Formula 1, ensuring this supercar goes down as one of the all-time greats. With Pininfarina’s innovative touch to the body work, the 458’s exterior styling and features were designed for aerodynamic efficiency. In particular, the nose sports small deformable aeroelastic winglets to the front grille that lower at high speeds, in order to offer reduced drag…Generating a downforce of 140 kg at 124 mph. Michael Schumacher also lent his expertise to the interior design of the car. All the main controls are assembled around the curve of the steering wheel as opposed to the dashboard allowing you to be in control of your surroundings at the touch of a button. Offering comfort as well as ease, the 458 is impressively cosseting, perfect for touring the open roads of Europe. Ferrari have also made an effort to reduce the environmental impact of driving a supercar: combined CO2 output is 307g/km, which is around 40g less than the F430, and less than some SUVs! Said to be Ferrari’s sportiest V8 engine, this 4.5-litre engine with its mid-mounted 7 speed dual-clutch transmission offers a great choice for self-drive hire if you want to experience awesome power and stunning design. The Ferrari 458 has a jaw dropping top speed of over 202mph. Weighing at just 1,380 kg, the 458 can go from a breath taking 0 – 62mph in just 3.4 seconds…..0.1 of a second behind the Ferrari Enzo! With an all-new 4.5-litre V8, it produces 562bhp at 9,000rpm and its razor sharp technical features allow for a maximum torque of 540 Nm at 6000 rpm making this feisty stallion the crème de la crème of prestige cars. And if that wasn’t enough to satisfy you, the engine features a direct fuel injection, a first for a mid-rear mounted setup, it is a performance car that will leave onlookers captivated. In the words of Jeremy Clarkson (Top Gear) the Ferrari 458 ‘really is absolutely… unbelievably… mesmerizingly… BRILLIANT!! If you have a need for speed, our two-seater coupe is a perfect choice for a weekend rental break, or just for an exhilarating super car driving experience. Currently being offered by special invitation only to our VIP clients, please do not hesitate to call our sales department on 0207 118 2244 for more information.